Whether you're on a call or listening to music, the Jabra Speak 710 is designed to handle it all. The built-in omni-directional microphone ensures your voice is picked up clearly while the built-in speaker offers enhanced audio playback. Configuring the Speak 710 is simple as it can be connected to your computer via a USB cable or synced to multiple devices via a Bluetooth connection. Once connected, this speaker can be used in conjunction with your favorite digital assistant and it even comes compatible with a variety of UC platforms including Avaya, Cisco, and Skype for Business. Experience the omni-directional microphone and HD voice ideal for voice, music, and multimedia. HD Voice / wideband audio gives you superior sound for enhanced voice collaboration - making sure that everyone is heard with improved clarity. Connect in seconds to a laptop, smartphone, or tablet via USB or Bluetooth. Be mobile with a lightweight design, protective travel pouch, and 15 hours of battery life. Interact with your digital assistant with the one touch Smart button. The Speak 710 is flexible and scalable making it suitable for both small and large meetings. Certified for Avaya, Cisco, and Skype for Business for a plug-and-play experience. Box Dimensions (LxWxH) 6.2 x 6.0 x 2.2"
Speak 710 (Microsoft Skype for Business) is rated 4.5 out of 5 by 2. Rated 4 out of 5 by George from Compact but no charger included The Jabra 710 is a mini-conference speaker with microphone. It even comes with its own carrying case. Starting out, 2 negatives: 1) no USB charger included, so you will need to include your current USB chargers, your laptop's USB (if sufficient amperage), or use your old USB charger for it; 2) Takes 3 hours to charge the battery. Positives: ability to link another Jabra 710 via Bluetooth, has a built-in stand if using it by yourself (so the speaker faces you rather than being flat on the table); and the fidelity is sufficient for Skype or Zoom conferencing. I will test it for music playback to see if it is sufficient for a webinar use. I would recommend it despite the negatives. Rated 5 out of 5 by Dennis K. from Excellent voice quality This was purchased to use with Skype for Business (SFB) on my Macbook Pro, and general use with my ipad, and iphone. So far I am very impressed with the excellent voice quality. The physical controls on the speakerphone worked fine with SFB on the Mac. I also used it for cell phone calls with an iphone 7+ and it sounded wonderful. It worked fine with my ipad air also. This speakerphone is leaps and bounds better than any portable speakerphone I have ever used. It is best for conferences, cell phone calls, and reproducing voices on podcasts or audio books. Yes music sounds great too, but keep in mind that it's not the primary purpose. I don't want to over hype the product. 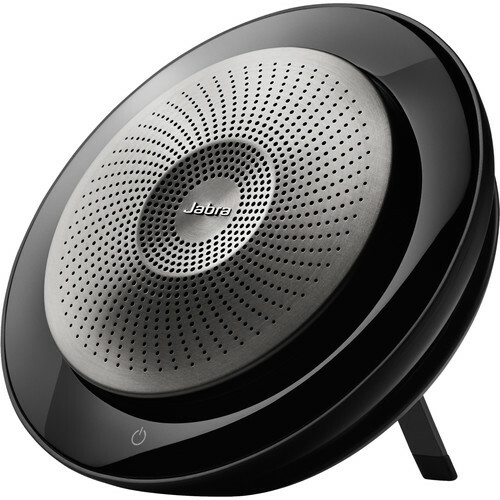 You will hear noises but they most likely won't be introduced by the Jabra 710. After all it doesn't fix poor cell signals and voip connections. But it does make those long hours spent on conference calls more enjoyable. It is also nice to have the option of not using a headset. There are some excellent technical reviews on the internet that will go into more detail on features. I would just sum it up to say that it's a well thought out device.